In a way, I wish I didn't tell my family and friends about this blog. It could have been my little secret. Then I could write down things without worrying what would happen if they read it. Nowadays nothing is secret in our life apart from our memories, dreams and thoughts, but i could of had this as well: A place where I could talk openly about my feelings, instead of the just the fashion and artistic aspects of my life. But then again, I am so glad I told them about this blog, because they know how much I am enjoying myself on here, finally finding people I share common ground with, as I don't really know anyone who is into the same things as me in the 'real world'. Once again, thank-you for reading my blog. Love, Jazzabelle. image from we heart it. I've kept my blog secret from my friends & family - well, it's not that I'm keeping it secret, I just have failed to mention it..! Which I am glad, because I don't want people I know in real life reading it, but also I keep having to bite my tongue, as I keep almost saying something about it by accident! I think as it becomes a bigger part of your life, it's harder to keep to yourself - for example, I have to wait until I've got the house to myself to take photos for my blog - because I don't want to have to explain what I'm doing.. it's weird. This comment was entirely pointless - I do apologise..
My family know about it too but don't really care too much I don't think. I have learnt to just write about whatever you want and forgert about who might read it. People you know are probably 1% of your total readers so you can't compromise your content because of people you know reading it. I can relate to this. I majorly freak out if I think people I know are reading my blog. My family don't know about it. The only people who know are my boyfriend and one close friend. Everyone else is pretty clueless. But who knows if this will always be the case. I love writing my blog, and truth be told I have never found anyone in the 'real world' who can relate to all my passion and admiration for the things I write about. && in reply to your question on my last post, I live up North in Sheffield. The boot sale I have been visiting is one of the largest near us; the only problem is sometimes there’s just too much. And I find it a bit difficult to know where to luck. There’s so much literal junk, its tough rummaging! But yesterday I was super pleased with the waistcoat at 20p, funny how you can just be in the right place. Noone knows about my blog, and I like it that way. My boyfriend would probably just laugh, but my friends would probably think it's pretty cool. And my mum wouldn't even know what it is! But I like having a place to escape too :) I LOVE writing my blog, and especially recieving comments. I kept my blog a secret for ages...silly really as all my friends know what my house looks like and that my clothes are all second-hand. I'm constantly in awe of your blog, the photography is stunning. Shall I make you envious? We've actually got three VW campervans but only Gylbert's on the road at the mo. The oldest is a 1968 Bay, we thought he'd be ready for Glasto but he's still poorly...maybe next year. I love the photo you have used in this post, So pretty! 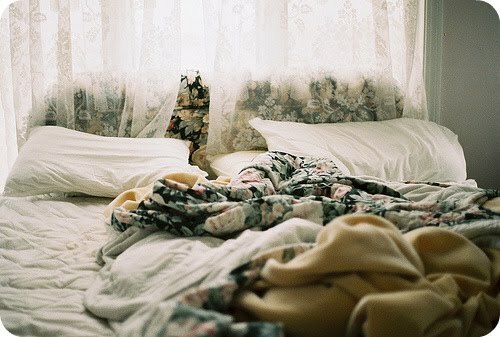 I wish my bed looked that pretty when un made!! Gostamos muito do seu blog. Entre no nosso e siga-nos.